Feeling bored of our usual gym routine of never ending treadmills and free weights, the Mister and I decided to try something a little different for our daily workout. So last Thursday night, we ditched the Big Apple and crossed the river to Jersey City for a beginners trapeze class with Guinevere DiPiazza, owner of Aerial Acrobat Entertainment . As a child, I definitely dreamt at least once  performing on the trapeze and being a part of the circus. On Thursday, that dream might become a reality. The Mister and I were lucky enough to have a private static trapeze session with Ms. DiPiazza, a professionally trained aerialist and dancer with over 10 years of experience. Her company Aerial Acrobat Entertainment has provided aerial, ground and specialty acts for parties and corporate events, but Ms. DiPiazza's goal was always to open a school and teach aerial techniques to the greater public. We started the hour long class with a few minutes of stretching to warm up our muscles. Then it was time to get on the trapeze! I must admit I was a bit daunted at first - given my noodle arms, I feared I would not have the strength to hold on and I'd fall flat on my face. However, Ms. DiPiazza gentle but encouraging demeanor calmed my nerves - plus, she stressed that safety is one of her highest priorities, so I felt secure with her watchful eye and professional training she would not let anything happen. And you know what? 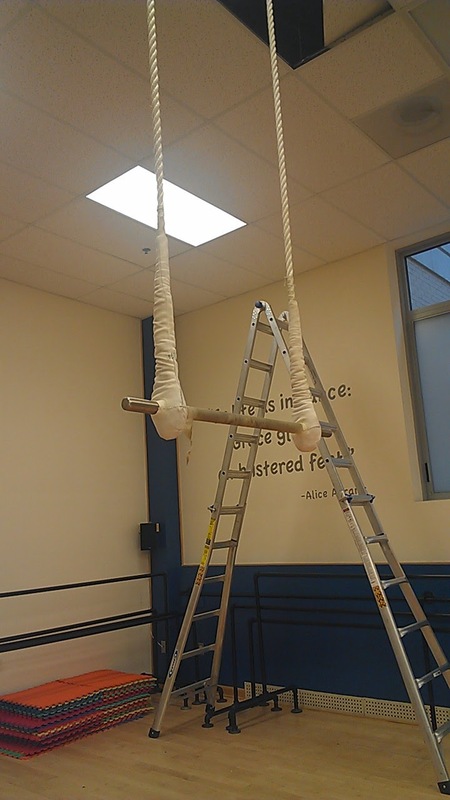 After I got comfortable with the static trapeze, it became a lot easier and a lot of fun. During the hour, I learned different poses and basic routines, as well as how to utilize my body for maximum support. The Mister, being far stronger than me, grasped the concept quickly - he was able to do the "Angel" pose all by himself by the end of just one session! Aerial Acrobat Entertainment classes are drop in over the 12-week summer period and include a variety of teachings including: silks and hammocks, lyra and trapeze, juggling, plate spinning, rolabola, hula-hoop, diabolo, rolling globe, unicycle and many more! For more information regarding class dates, times and prices, visit AerialAcrobatEntertainment.com.